Made from high quality 100% combed, ringspun cotton. The 1x1 rib has great elasticity and the custom, contoured fit clings to the body. Low shrinkage. This 3/4-sleeve, femme cut, raglan tee is printed on an "American Girl" shirt by American Apparel. 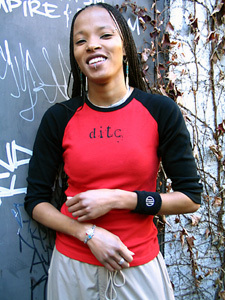 It is a red tee with black screenprint featuring the dykesinthecity "ditc women" logo on the front chest and the "ditc" circular logo on the back neck. This is a snug-fitting, "teen"-sized shirt. It is recommended that you order a size larger than usual.